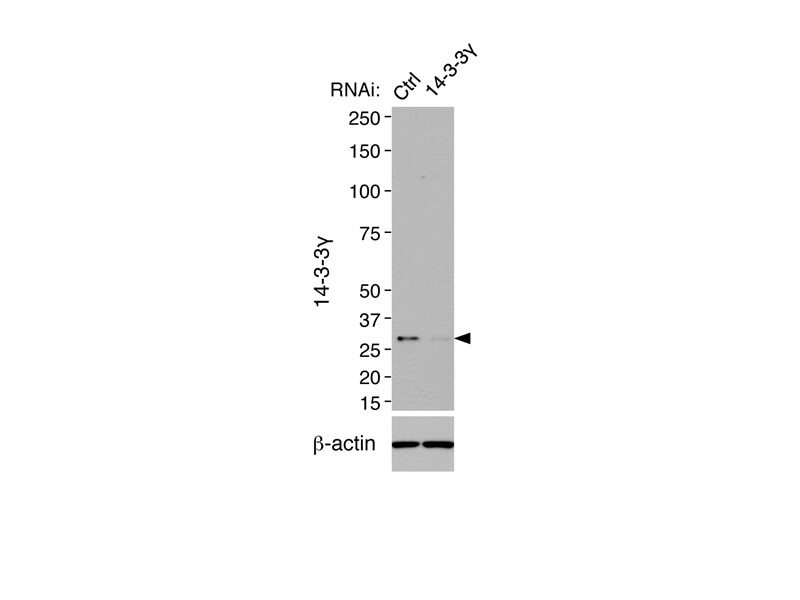 RNAi result of 12381-1-AP(anti-14-3-3G) in Mouse IMCD3 cells From Dr.Seongjin Seo. IP Result of anti-14-3-3 GAMMA-Specific (IP:12381-1-AP, 3ug; Detection:12381-1-AP 1:800) with mouse brain tissue lysate 8000ug. 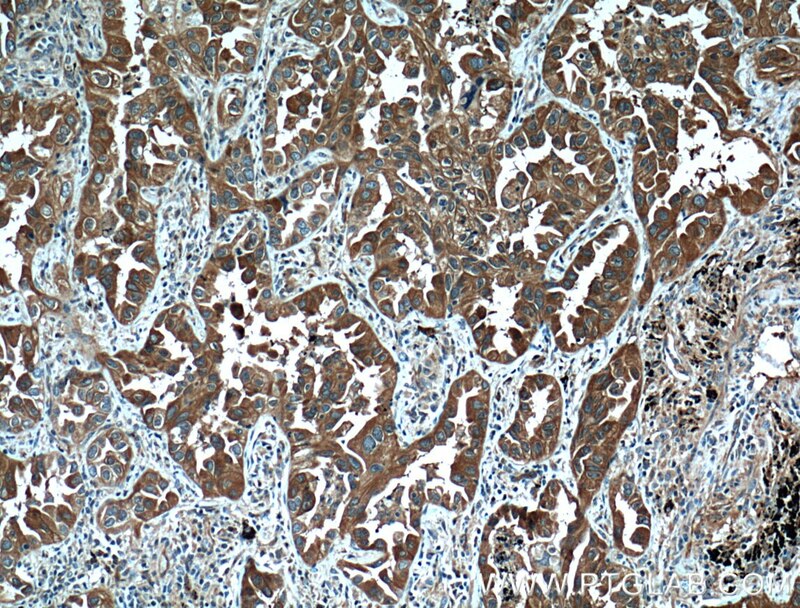 Immunohistochemical analysis of paraffin-embedded human lung cancer tissue slide using 12381-1-AP( 14-3-3 GAMMA-Specific antibody at dilution of 1:200 (under 10x lens). heat mediated antigen retrieved with Tris-EDTA buffer(pH9). 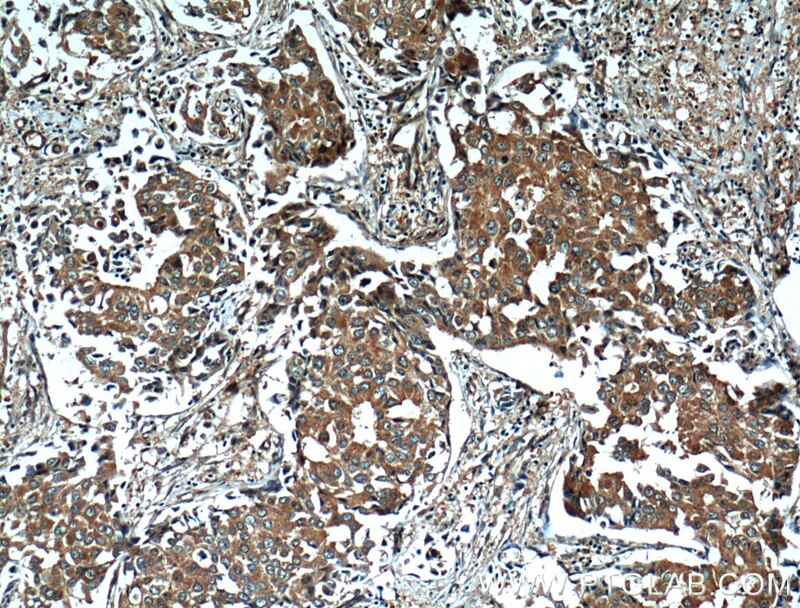 Immunohistochemical analysis of paraffin-embedded human lung cancer tissue slide using 12381-1-AP( 14-3-3 GAMMA-Specific antibody at dilution of 1:200 (under 40x lens). heat mediated antigen retrieved with Tris-EDTA buffer(pH9). 14-3-3 gamma (also known as YWHAG) is a member of 14-3-3 proteins which were the first phosphoserine/phosphothreonine-binding proteins to be discovered. 14-3-3 family members interact with a wide spectrum of proteins and possess diverse functions. Mammals express seven distinct 14-3-3 isoforms (gamma, epsilon, beta, zeta, sigma, theta, tau) that form multiple homo- and hetero- dimmers. 14-3-3 proteins display the highest expression levels in the brain, and have been implicated in several neurodegenerative diseases, including Alzheimer's disease and amyotrophic lateral sclerosis. 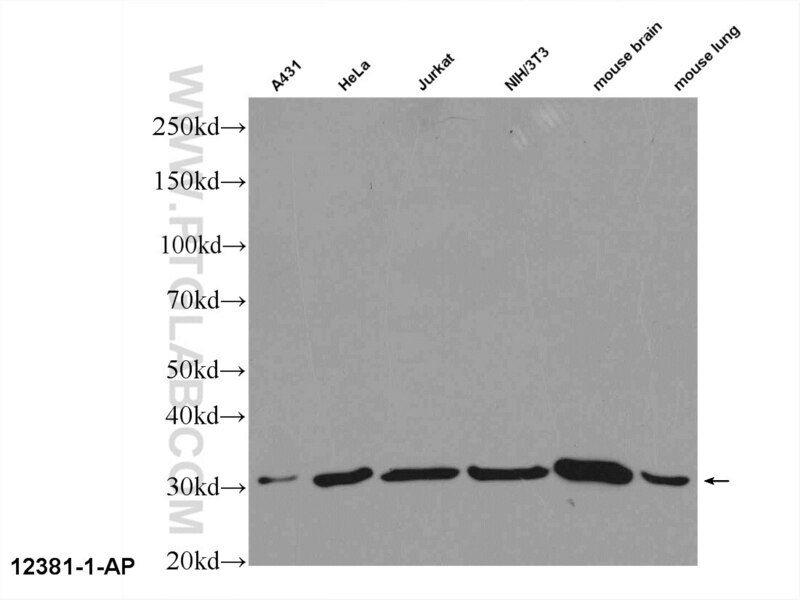 This antibody specifically recognizes gamma isoform of 14-3-3. Proteome analysis of porcine epidemic diarrhea virus (PEDV)-infected vero cells. 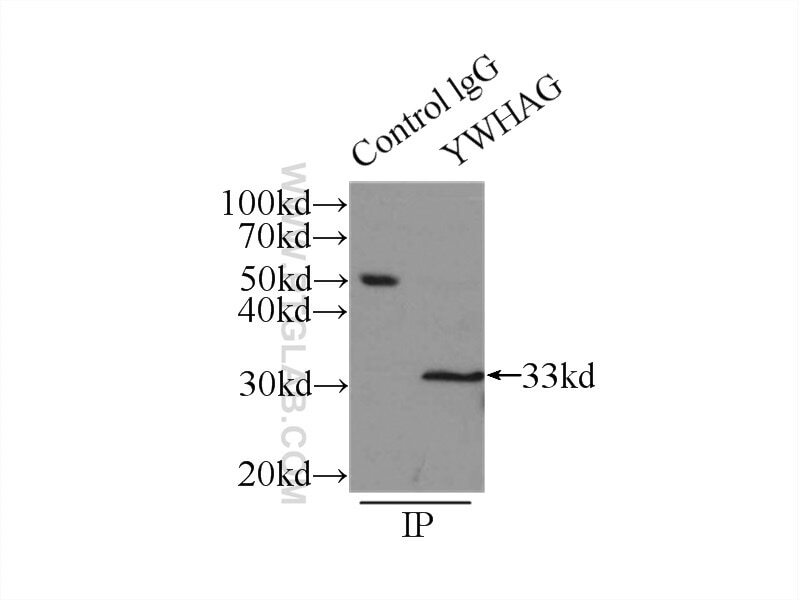 YWHA/14-3-3 proteins recognize phosphorylated TFEB by a noncanonical mode for controlling TFEB cytoplasmic localization. 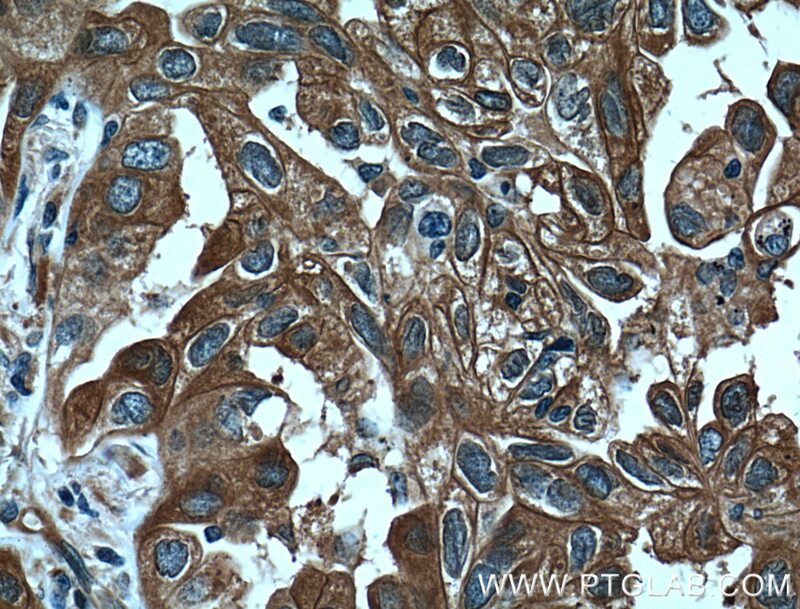 Immunohistochemical analysis of paraffin-embedded human breast cancer tissue slide using 12381-1-AP( 14-3-3 GAMMA-Specific antibody at dilution of 1:200 (under 10x lens). heat mediated antigen retrieved with Tris-EDTA buffer(pH9). 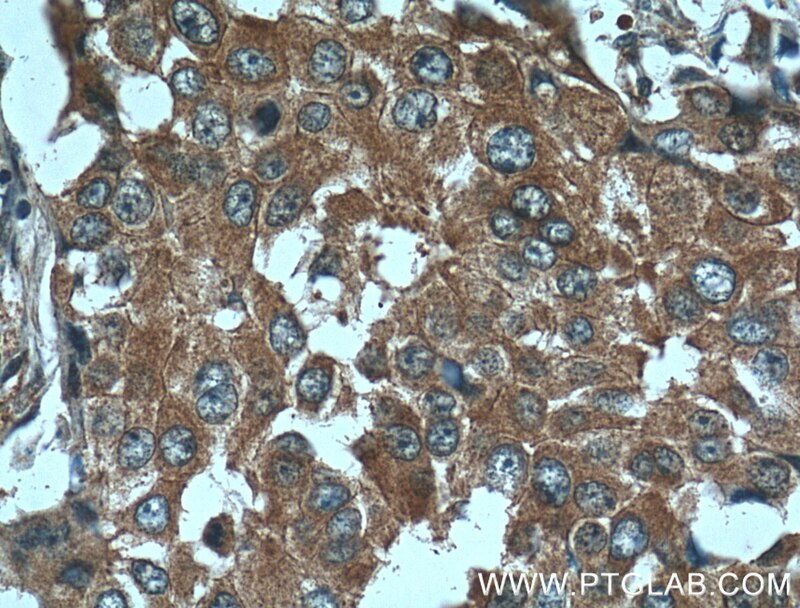 Immunohistochemical analysis of paraffin-embedded human breast cancer tissue slide using 12381-1-AP( 14-3-3 GAMMA-Specific antibody at dilution of 1:200 (under 40x lens). heat mediated antigen retrieved with Tris-EDTA buffer(pH9).